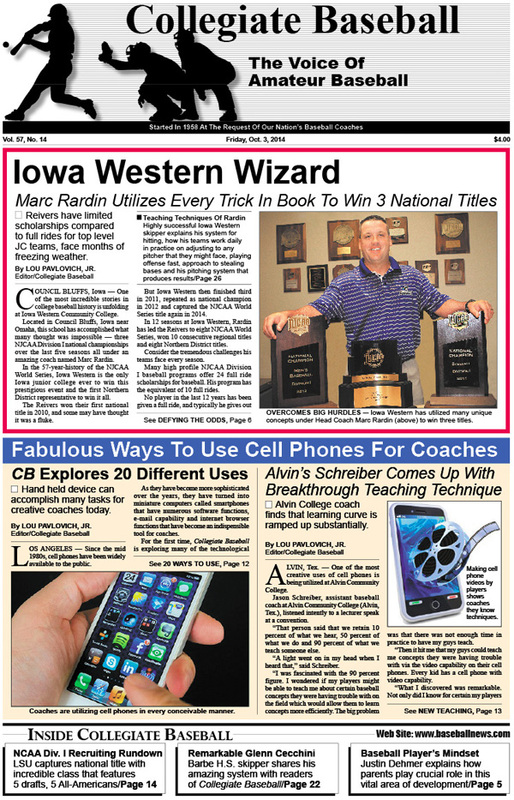 Special Report: How Marc Rardin has led Iowa Western to three national titles in the last five years with in-depth reporting on his system. In-Depth Report: Collegiate Baseball explains 20 different ways coaches utilize cell phones. Plus, Alvin College’s Jason Schreiber comes up with breakthrough teaching technique for players that involves the video function of cell phones. NCAA Div. I Recruiting Rundown: LSU captures national title with incredible class that features 5 drafted players, 5 more who are All-Americans. Barbe High School’s Amazing Glenn Cecchini: Fabulous Louisiana skipper has led Buccaneers to seven state titles with incredible system. Baseball Player’s Mindset: Justin Dehmer explains how parents play crucial role in this vital area of development. Charlie Greene: Fear of change causes big problems. Jack Dunn: Avoid base running mistakes by teaching sound fundamentals. New Test To Slow Down Tommy John Surgery: Micheli Center For Sports Injury Prevention in Waltham, Mass. utilizes cutting edge approach to evaluate pitcher’s strength and flexibility. Lou Pavlovich Column: Volcano eruption couldn’t stop Gonzaga from making Regional tournament in 1980. Bill Seamon: Passion is vital when coaching baseball. New Products: CB lists a number of outstanding new items for baseball. College Coaching Changes: A number of head coaching, assistant positions are filled in recent activity. Notre Dame utilizes HitTrax technology for hitters. Oregon State builds new facilities at over $4 million. American Legion World Series: Brooklawn, N.J. wins second straight title with 18-0 victory over Midland, Mich.
High School Notes: Coach Terry Terrill of Riverdale Baptist H.S. (MD) celebrates his 1,000th win. Ruleball With Rich Marazzi: Wild game takes place in Wisconsin with resumption of game starting with 3 outs. Special Report On Baseball Vision: Dr. Bill Harrison explains what it takes to be skilled with vision in hitting, fielding. ABCA Convention Update: Clinic Chairman John Casey gives a rundown on a remarkable cast of clinicians slated for world’s largest baseball convention scheduled for Orlando, Fla. Jan. 2-5. Bellingham Bells win West Coast League title with 3-2 victory over Corvallis. Instructional clinics scheduled across USA. To order the Oct. 3, 2014 edition of Collegiate Baseball or subscribe, CLICK HERE.